Eight years after his first trip to Japan, Ron Henderson’s exhibit documenting Japanese horticulture and history is back for a second showing at the National Bonsai & Penjing Museum. Henderson first traveled to Japan as an architectural graduate student at the University of Pennsylvania, then frequented the country during his tenure as a landscape architecture professor at Tsinghua University in Beijing. He later submitted a proposal for his trip to a Japan-U.S. commission that facilitates a three or four-month artistic fellowship in Japan. After his proposal was selected, he departed for his two-month journey and started to sketch the blossoming sakura orihon. 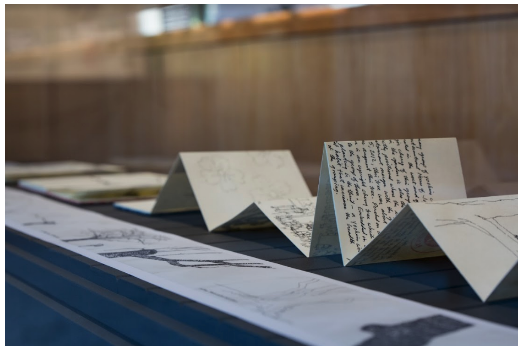 But the idea to share his drawings at the Museum was not set in motion until after a preliminary talk about his proposal’s findings at the International House of Japan, where he received “substantial encouragement” to display his sketchbooks. Henderson says the most difficult part of designing the sakura orihon exhibit was defining the facets of his journey. His exhibit focuses on three narratives: cherry blossom culture, notable Japanese cherry trees and unique Japanese horticulture techniques. While horticulture practices in the United States have normalized using discreet cables or hidden devices for trees’ structural support, Henderson says Japanese trees are supported with elegant – but visible – braces, crutches and ropes, as evidence of a reverence for sustaining life. 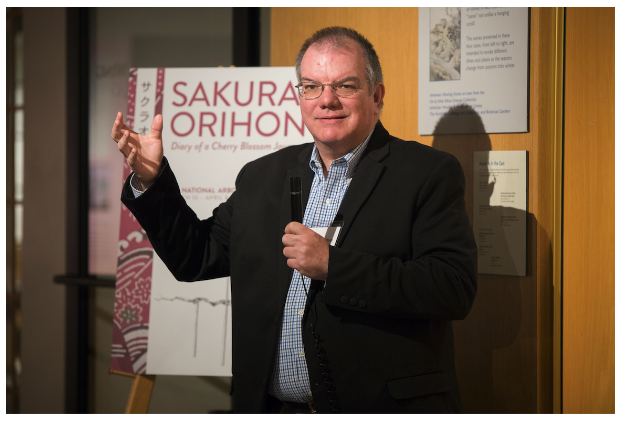 Henderson’s current exhibit is on display through April 7, but he hopes the sakura orihon story will return to the Museum for as long as the public demands. Kathleen Emerson-Dell, the exhibition’s curator, says Henderson’s themes resonate with the U.S. National Arboretum audience and advance the Arboretum’s mission to preserve plants from around the world. The U.S. Department of Agriculture has introduced flowering cherry cultivars and species, from Japan and elsewhere, to American gardens since the beginning of the 20th century. About 50 varieties of flowering cherry trees are planted across the 446-acre Arboretum, and the collection’s diversity permits a much longer flowering display than that of the Tidal Basin. “Ron’s exhibit adds to our understanding of the genetic sources for ornamental cherry trees from Japan,” Emerson-Dell says. Sakura Orihon exhibit runs until April 7th. Learn more here and plan your visit today.